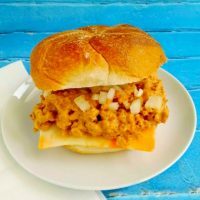 Extra lean ground chicken is simmered with a delicious burger flavored sauce in these Chicken Cheeseburger Sloppy Joes. Not only do they taste like a diner burger, but they’re quick, easy and a delicious weeknight meal kids of all ages will enjoy. Pardon me while I throw a small temper tantrum. Trust me, I’ll get to this deliciousness in a minute. The two are related. The new house is a little further out than where we were before. Normally this wouldn’t be an issue, but lately it has become a small one. “Why?” you ask? Because people are not paying attention while they’re driving and causing accidents. One accident on this particular road can cause hours of traffic delays. It doesn’t help that DC is in the top 10 of worst traffic cities in the nation. And, I’m sad to say, it’s a common occurrence to have at least one or two accidents on the way home lately. It also doesn’t help having the added distraction of a phone in the car. Be it texting, dialing, or just scrolling through your feed, it’s not something to do WHILE DRIVING! This week I’ve seen about the worst offenders ever. The person in front of us was weaving all over the road. Granted, she didn’t belong in the HOV lane in her non-energy efficient car driving solo, but still, she was holding her phone in front of her face while driving. The guy a few cars up in the other lane? He was blatantly STOPPED in the middle of the road just texting away and didn’t realize that traffic had started moving. It’s the weaving because you’ve taken your eyes and your hands off the road but your foot is still on the accelerator, the driving really slow and then gunning it when you realize you’re way behind traffic, and the simple fact that you are NOT paying attention while driving that causes accidents. So, let’s make an analogy if you will. You wouldn’t dare do all of or any of these things while firing a rifle or a pistol would you? You wouldn’t do any of these things while sky diving would you? Bungee jumping? Operating a wrecking ball? Not concentrating while doing any of these tasks could result in serious injury or death. Well, it’s kind of the same with a car. It’s a weapon if not carefully operated. Driving is a privilege; not a God given right. Having a cell phone is a privilege; not a God given right. Living is a God given right. Please put the phone down. And if you MUST, then please pull over. There are shoulders and rest areas. NOTHING is that important. N.O.T.H.I.N.G is that important that you have to jeopardize your safety and those around you just to answer a text or make a phone call. Or even worse, just checking your feed. PSA over. Thank you for allowing me to get that off my chest. The reason I’ve been concentrating on quick and tasty eats like this recipe is due to the traffic being craptastic of late. We use Waze on the way home and we dread the infamous “Accident reported ahead” alert we hear on a daily basis now. To which I respond with, “Shocker” in the most snarcastic tone ever. Then I start counting the drivers NOT paying attention to the road and just shake my head. So, I’ve made this once before, but just didn’t get around to taking pictures of it to post. Trust me when I say this is DELICIOUS! Seriously. Lick the pan delicious. It tastes just like a diner burger; all ketchup-y, mustard-y, cheesy goodness on a bun! Add some easy fries and dinner is on the table in under 30. Now, S isn’t a huge fan of pickles. So, I didn’t put any in this dish, but I imagine you could dice up some nice dill pickles to stir those in and it would taste even MORE like a diner burger. It actually reminded me of my childhood favorite; White Castle! Oh man how I miss those things. Yes, I know. They’re like the worst for you, but they taste SO GOOOOOOOOOOOD! Especially to a kid. And their onion rings? YUM! Even their little fish sammies are pretty darn good, too. No, this isn’t an ad for White Castle. This is a recipe for a diner delicious recipe for Chicken Cheeseburger Sloppy Joes. Sloppy joes are super easy, tasty, and pretty darn quick. I love all the different versions I’ve been coming up with lately. I’ve made some chicken fajita, eggplant, green chile, taco, turkey cheesesteak, supreme pizza, and Philly cheesesteak. I have many more in my head. I’ve made a few other recipes but just didn’t photograph them before we devoured the pan. Honestly. Just look at how delicious that is! Grab a napkin. These are definitely messy good. I had a hard time keeping the meat on the bun. Granted, it was a hoagie roll and maybe a hamburger bun would be better? I don’t know. But, what I do know is that these taste just like a diner hamburger with all the fixins. Top it with some tomato and lettuce and you’re all the way there. What’s your favorite sloppy joe recipe? Extra lean ground chicken is simmered with a delicious burger flavored sauce in these Chicken Cheeseburger Sloppy Joes. Not only do they taste like a diner burger, but they're quick, easy and a delicious weeknight meal kids of all ages will enjoy. Add the remaining ingredients, with the exception of the American cheese, and simmer 10 to 15 minutes or until thickened. Remove from heat and stir in the American cheese. Place a bun on each of four plates and divide the mixture evenly between them. Serve with french fries for the complete cheeseburger experience. My family would go crazy for this. I love the addition of cream cheese. I pinned to make soon!